Science Series: The Flat Earth Myth | Is Christianity True? Quickly, answer the following question: “Who proved the world was round?” If you said Columbus, you are certainly not alone. We have all heard the idea that before Columbus, the Church and all the Christian intellectuals of the Middle Ages taught that the earth was flat. If you sailed out far enough you would fall off the face of the earth. Unfortunately, you, along with many others, have been vastly misinformed. No Christian scholar, theologian, philosopher, or priest in the Middle Ages believed that the earth was flat. Where did this idea come from that the earth was flat? The belief that educated people in the Middle Ages believed the earth was flat and Columbus braved superstition and ignorance by sailing across the Atlantic when his contemporaries thought he would fall of the edge has been circulated so widely it is held as common sense today. The seeds of the invention of the Flat Earth myth were planted by Copernicus (1473-1543), watered by Washington Irving (1783-1859), and came to fruition with Andrew Dickson White (1832-1918). – Copernicus, Preface to On The Revolutions (1543) – Copernicus compared his opponents who insisted on geocentric model with the ignorance of those who believed in a flat-earth like Lactantius. – Washington Irving, History of the Life of Columbus (1828) – Irving invented a fictional telling of Columbus and the fictitious “Council of Salamanca” in which Columbus was assailed by a parade of biblical and medieval sources touting a flat earth. As you can see the Middle Ages were maligned with a belief that was invented and spread by the creative fiction of subsequent generations particularly in the nineteenth century but has had continual ramifications in the twentieth and twenty first century. In contrast the ancient world was quite progressive in its near universal adherence to a spherical earth: Pythagoras, Parmenides, Plato, Aristotle, Euclid, Archimedes, Strabo, and Ptolemy all believed in spherical earth. The so-called “Dark Ages” glimmered with enlightenment concerning sphericity of the globe with Christian intellectuals such as Isidore of Seville, Bede, Basil of Caesarea, Ambrose, Augustine, Albertus Magnus, Thomas Aquinas, Roger Bacon, Brunetto Latini, and Dante all believing the earth was a globe. 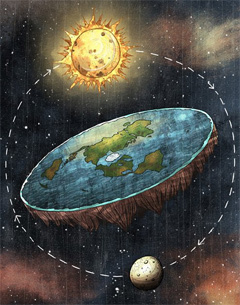 Even the Enlightenment rarely charged the Middle Ages with the belief in the flat-earth, being fully aware that sphericity was central to their beliefs about the earth. Jeffrey Burton Russell, emeritus professor of History at the University of California, Santa Barbara, states, that “nineteenth and twentieth-century writers flattened the medieval globe.” What this myth tells us, according to Russell, is that historians and scientists pass on error as well as truth, especially when led by biases rather than evidence and fact. When methodology and sources are not checked it can lead to myths that can take on a life of their own. The flat-earth myth is based on the conviction that church was opposed to science leading to a conflict model. This model is relatively recent beginning with John W. Draper in his History of the Conflict between Religion and Science as the first influential figure to declare a war between science and religion followed closely by Andrew D. White. The flat earth myth is a slanderous falsehood concocted by opponents of Christianity in the 19th century which has been debunked by historians today. Along with the myth that Galileo was thrown in a dungeon for promoting a heliocentric model of the universe, the flat earth myth needs to be buried. The conflict between science and religion is smoke and mirrors. There is no conflict as it is popularly presented to us today.